Think Texas can secede whenever it wants? Not quite. If you want to hold public office in Texas, you have to believe in God. You cannot serve even as dog catcher – if it’s an elected office, you must believe in God. Given the long history we have had of con artists, and scofflaws, carpetbaggers, and white-collar criminals holding public office around the state, this may seem hard to believe. But it is right there in the Texas constitution. Plain as day. And this would presumably rule out agnostics, too, since they are eternal doubters and could not, with confidence, say that they believe in a Supreme Being. This is just one of the unusual dimensions of the Texas Constitution that few people know about. Texas protects individual rights more than most states. In Texas, credit card companies cannot garnish your wages to collect on a bad debt. Texas is exceptionally protective of debtors in bankruptcy cases, too – especially if you actually own anything worth losing. If your house is paid for – even if it’s worth $2 million – you get to keep it. If your house sits on 200 acres in the country, you get to keep that. If you have a big, bad, fully decked out pick-up, and it’s paid for, you get to keep it. Finally, you get to keep two firearms. I don’t know why. I suppose to help you protect your property from pesky bill collectors. Most Texans seem to believe that Texas has a constitutional right to secede from the U.S. when it feels like it. It does not. This is a myth. However, Texas does have the right to divide itself into two, three, four or five states. The only advantage would be to give us 10 senators instead of two. I don’t know what advantage that would be, since eight more senators would be about as useful as a bucket of water to a drowning man. But Texas would not be Texas if it were divided. Such plans have actually been discussed. According to the Handbook of Texas, one plan wanted to divide the state along the Colorado River, with the new territory south and west to be called Lincoln and the part north and east to be called Texas. Another plan proposed dividing us into three states. These would be called Jefferson, Texas, and Matagorda. None of these plans ever made it out of committee. I suppose the legislators knew that had the good people of Texas gotten wind of it, they would have gotten a long Texas rope, and strung them up from a live oak. W.F. Strong is a Fulbright Scholar and professor of Culture and Communication at the University of Texas Rio Grande Valley. At Public Radio 88 FM in Harlingen, Texas, he’s the resident expert on Texas literature, Texas legends, Blue Bell Ice Cream, Whataburger (with cheese) and mesquite smoked brisket. 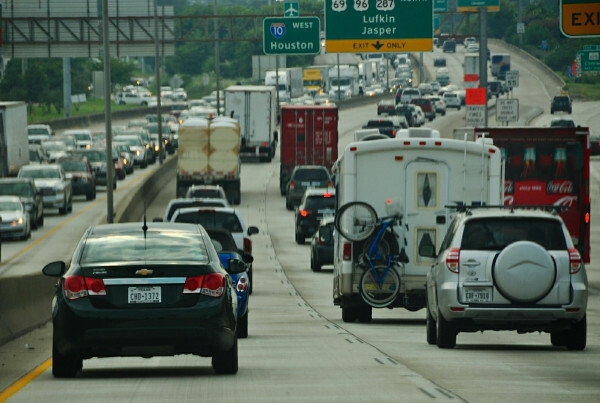 Does Sitting in Traffic Really Cost Texans $1,500 A Year? Will Better Standards Prevent Jailhouse Suicides? What is Governor Abbott Doing in Cuba?